In truth we only visited Verin because of it close proximity to the castle of Monterrei on the hill above the town. Verin is close to the Portuguese border and, along with A Guarda, is Galicia's most southerly town of any note. From a tourist perspective it barely makes the map, but it is one of those towns that you may want to call in at for some refreshment if you find yourself in the middle of nowhere whilst exploring southern Ourense. As with many of the real Galician towns, I actually liked Verin. We struggled (or rather Maria did) to understand the rather extreme Gallego that is spoken there, but the town was clean and had a nice river feature with a small child friendly weir, some children's play areas and nicely set out pathways both sides of the river's banks. We also had a coke at one of the riverside bars under a trellis canopied with vines in full fruit – not something you can readily do in England. Verin has a small old district, but nothing to compare with places like Ribadavia, Betanzos or Noia and the town is rather elongated from a casual walk around point of view. Unusually we noticed that street parking was not free, but metered. This is very uncommon in Galicia, even in the cities. 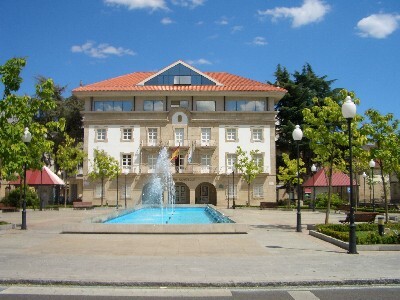 What the town did have was a number of tapas style bars, a modern but great looking town hall building with a pool and fountain in front of it and to the side of that an old pazo (now a police station). Photos left and below show a former pazo and the modern Town Hall. 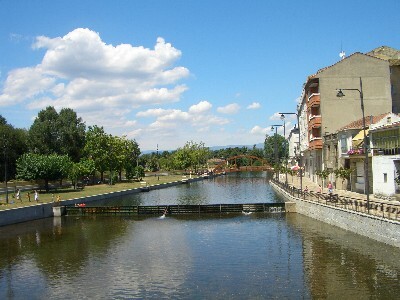 The top picture shows the river that runs through the town. There is a nice bar alongside the river with a vine canopy above the outside seating area (or at least there was back in 2006). 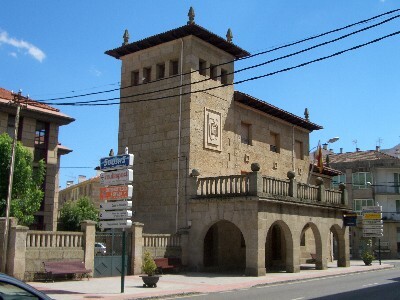 It goes without saying that Verin does not claim to be a tourist town, but if you have visited Monterrei castle it is your best bet for a coffee, a coke (the drink) or something to eat. Otherwise, give it a miss.